The Prince George Airport (YXS) is a proud member of the Prince George community and of the greater Northern BC community. 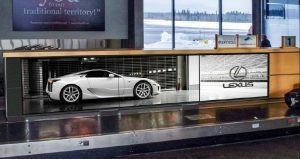 YXS welcomes businesses and organizations to benefit by displaying their message to the airport passengers and visitors, on the various creative displays available inside and outside the terminal to inform this market of your products and services. The Airport’s advertising is managed by Pattison Outdoor Advertising.